Bali, Island of the Gods, is now the Island of the Rock Gods. 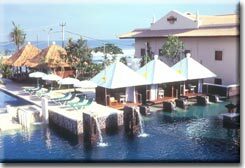 Planet Earth’s first Hard Rock Hotel, a Hard Rock hotel resort, on happening Kuta Beach. We are waiting to welcome you all day all night. Absolutely unique in the history of mankind, this Hard Rock Hotel is the beginning of a new generation of themed hotels bringing the famous fun and good times of the Hard Rock Cafe to hotel accommodation around the world. The second you walk in, you enter the heart of the Hard Rock Hotel. Centerstage is an open-air area with a huge video wall playing music videos, Hard Rock memorabilia and a raised stage for unplugged concerts. When you walk into Centerstage, you know you couldn’t be anywhere else on earth but the Hard Rock. Situated at Bali’s famous shopping and entertainment district, Kuta, just 10 minutes drive from Bali airport, you’ll find the Hard Rock Hotel which offers more than just comfortable accommodations, it also blends tropical majesty with today’s modern luxury. This is the ultimate themed vacation resort with Hard Rock’s signature of limitless energy, unparalleled creativity and quality service – the perfect place to Rest, Relax & Rock!